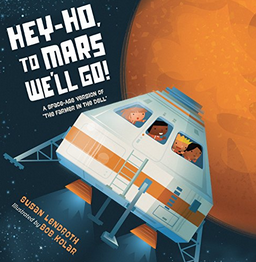 Storytime Spotlight: Hey-Ho, To Mars We’ll Go! Staring out into the dark, starry night, have you ever wondered what it would be like to go to Mars? At some point in our lives, we all dream about what it would be like to experience weightlessness in space as we travel to distant planets or galaxies. This wonder begins in early childhood as children begin to notice the sun, moon, stars, and clouds in the sky. The Book of the Month for our preschool Fireflies program is a sing-songy fiction story: Hey-Ho, To Mars We’ll Go! A Space-Age Version of “The Farmer in the Dell.” The main part of the story is written in the style of the traditional song, but author Susan Lendroth includes a dash of nonfiction information on each page. For example, the first page of the story depicts children boarding a rocket and the informational text provides a bit of information about gravity. Illustrator Bob Kolar keeps things interesting by capturing weightlessness as children are floating – sometimes upside down – on a page. The illustrations and text rotate in orientation as the reader turns the pages, giving the reader a sense of weightlessness as he or she enjoys the book. Children will learn a little about living in space as they listen to the story and look at the pictures of the tiny astronauts eating, working, sleeping, grooming, etc. The last page of the book provides more factual information about a manned mission to Mars and includes websites where children can learn more. If you did not order a Teacher Pack for April, you can get your own copy of Hey-Ho, To Mars We’ll Go! here.